What a rocking episode, it was such a roller-coaster. So very much to talk about. is a deliberate choice on DemonDean's part. Whether to mess with Sam in some evil way somehow or just to test whether or not he is in fact a human or a demon by placing himself in a situation where he'll have to either rein himself in enough to not kill Sam or...not. Yikes. 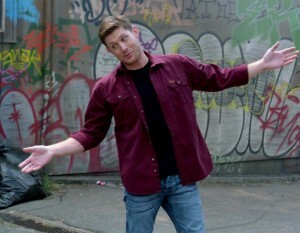 Seems pretty obvious to me that DemonDean could have pushed Sam away with his right hand, or flipped him with his left. I don't know, it seems very strange that he just gave in so easily. Who knows, maybe it's just because of Jared's actual real-life injury that this comes off to me as almost carefully tender. 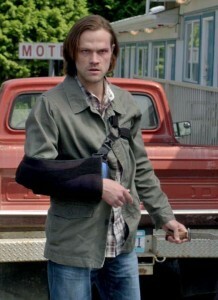 Note, I am not at all saying that Sam wasn't a complete and total badass in this episode, because to me he was. Approaching a demon when injured as he was, and just plain not giving up for anything to try and get through to his brother. Tangling with Crowley, escaping from Cole, hot-wiring and shifting an old manual truck all with one hand tied behind his back. How the heck did they make Jensen look so young? Camera, makeup, lighting and a good shave I guess. It was distracting honestly, but seeing the Samulet was even more distracting. And the giant leather jacket. He has so much compassion on his young face here, like he's so sorry for what this poor kid has to deal with finding his father dead. I liked that they left it ambiguous as to what exactly happened. 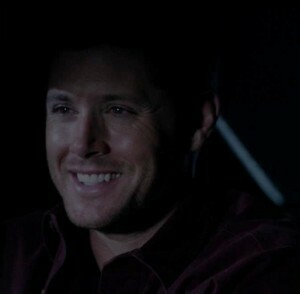 Dean's whole demeanor as he killed Lester was chilling, look at this smile, there's not a trace of humanity in there, just demonish delight and satisfaction. And what a complete turn from the previous picture. 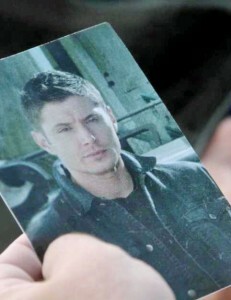 How about this handy-dandy picture of Dean that Sam just happens to carry around? Just thought it was funny that he had one at all. It always seems strange when they actually have pictures of each other. and the female one looks fabulous, her hair is gorgeous, and I liked her smile when Crowley was pushed down by DemonDean. But her look of distaste while "Hey There Lonely Girl" was playing as Crowley looked at his goofy cowboy hat buddy pic was perfect. Was it just me or did that picture look like a con photo op that Mark had taken with Jensen or vice versa? "I think you don't know what you want." was so very very accurate, Dean has no idea, he's just letting himself kind of float through this experience. But the pointed "Pick a bloody side!" really works as an expression of his frustration and sort of a command to Dean. I loved it that Crowley backed off from confronting DemonDean, because he could instantly see that DemonDean was much much stronger and much more out of control than he'd thought. He was so fast to pawn him off to Sam. 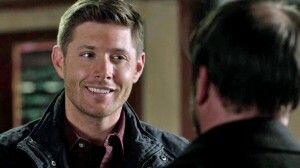 Just look at that smile, he'd just love an excuse to mess you up Crowley. "You miss me?" Crowley asks. 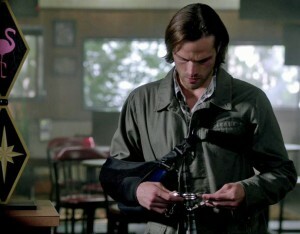 ugh Sam's look and answer with demon knife in hand, "So much." He looks so ill, and unhinged here, and reminds me a whole lot of fthe Jack Torrance character that Jack Nicholson portrays in "The Shining." 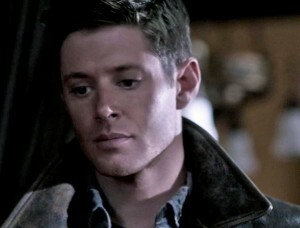 He has not taken care of himself at all in Dean's absence, pushed himself too hard and for too long. But he had no other options. 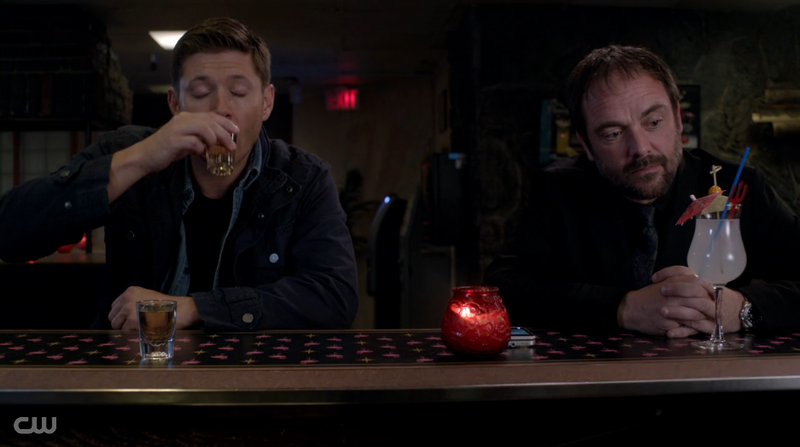 And at this low point, he makes another deal with Crowley. Because why not one more for the Winchesters right? "You're here for Dean, and I'm here to give him to you." As if he's yours to give Crowley, give me a break. "Dean's your problem now. Again. Forever." Sounds about right to me. Just about the way Sam likes things. How much do you love it that the express elevator to Heaven is still located in the children's playground sandbox? Babies in trenchcoats (or ugly suits) all. And Metatron calling Cas "Asstiel", definite lol at that one. Metatron was super creepy in his scene. And I liked Hannah quite a lot in that one. The difference between Cas and Hannah's discussion and Sam and Dean's about deal making to save one's life is quite striking. I'm not sure about why we're supposed to care about the angels anymore, they're just not selling it to me to make it worthwhile that they get so much of the screentime in an episode. Wish that they'd make it more interesting if they're going to keep the angels around. Why was everything shaking and kind of roaring when DemonDean was remembering what Crowley asked him about human vs. demon pick a side? I took it to mean that there's a battle raging inside his head that is shaking everything apart. And I swear the tune he was playing on the piano was the first notes of "Hey Jude". So if that's true, he's still got the humanity to deal with, it isn't all gone, just very very buried under the demon-ness. "Hiya Sam. Who winged ya?" Actually showing concern or expressing interest in someone to take revenge upon? 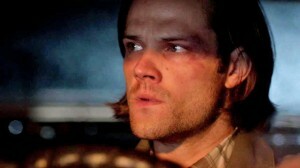 And he just looks kind of pissed that Sam's there. 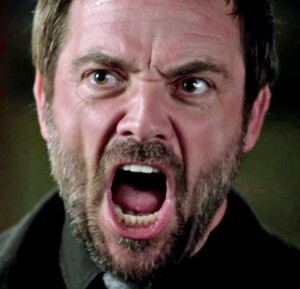 Like he doesn't want to make the decision that Crowley is pushing him towards. And he knows deep down that Sam is of course the linchpin that decision depends upon. 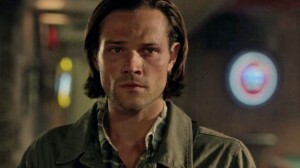 Sam's face when he sees his brother alive for the first time is a killer. In this very moment he realizes that all those weeks searching have been worth it. When he hears that familiar voice it all sinks in. Dean is here, right in front of you. If you can just get through to him past all the layers of whatever becoming this sort of demon means. He doesn't want to let himself hope, but he can't help it. This whole scene was off the charts soaked in the brotherly chemistry and emotion that powers this show. When they're finally back in the same room together it just ignites. "You're my brother and I'm here to take you home." Such a perfect line, and so perfectly delivered with the wet eyes. Dean's response is so visible, he's like an empty sponge soaking it up, what he's always wanted to hear, so much so that it almost scares him so that he has to pause, take a drink, compose himself and then try to laugh it off by teasing about puppy eyes and Lifetime movies. I expected him to say something like "And oh, you're calling the bunker home now, huh Sam? Good to know." The way Sam looks at the handcuffs before starting to approach DemonDean, like he was steeling himself for the confrontation to come. You can almost hear his internal conversation, "I can't believe I'm having to do this. Use these on my brother. And at this point I don't care if they work or not." Cole's fight with DemonDean was pretty exciting, of course he was just being played with, but he didn't know that. I am still interested in this Cole character's story, specifically whether Dean actually killed his father, or if a monster that Dean was hunting did. Cole calling him Dean-o really really irked me for some reason. As did the obvious question, 'Why would he not know about the supernatural if he'd been following Dean for years?' He says I know all about you, but he really doesn't does he? Especially not about your pretty pretty black eyes. The Princess Bride reference was really really great. And I loved seeing DemonDean revel in being such a complete jerk while cleaning Cole's clock. Sam's hesitation in handing over the First Blade to Crowley was so real, how could he.bring himself to actually do that? And why didn't he try to jab Crowley in the gut with it? 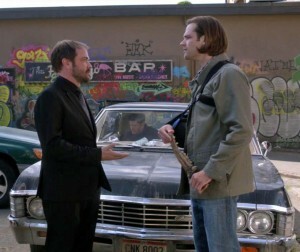 But that was what the finder's fee was that Crowley charged Sam for the info to find Dean. I could see him telling himself "See Dean, you're worth giving up control of one of the most powerful weapons we've ever encountered to the King of Hell. 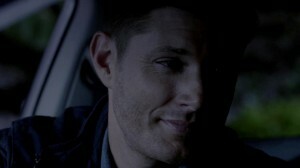 That's what you're worth to me Dean." Dean's glee at what he did to Cole was terrifying. Is it an act? Is he trying to convince himself how much of a demon he really is? Or is he actually this awful of a demon already?Chilling. "And what I'm gonna do to you Sammy? Well, that ain't gonna be mercy either." Sam looks scared to death at that threat, what the hell have I got in the backseat, and then you can see him settle himself in for the long haul challenge that lies ahead of him, this is my brother and I'm going to save him. He knows now that the emotional appeal isn't going to work all on its own and he'll have to physically control him during the whole time the blood cure is taking effect. Dean calling him Sammy most of the time is killing me (and I'd imagine Sam too), it's either delilberate on the part of DemonDean just to mess with Sam, or it's an unconscious leftover of Dean. I don't know if I'm going to be able to take next week's episode, from the previews it looks like an even more exciting roller coaster. Looking forward to it! I love that gif of their hands when Sam is putting on the cuffs. It's almost as if Dean gave himself up, although that snarl of frustration he gave gives his actions the lie. I was so amazed and blown away by the way Jensen portrayed Demon Dean, and by the compassion and bravery displayed by Sam, that this ep is in my top 10. I just wish we didn't have to waste time on the Angel story line. It cuts into my Sam and Dean time, and I don't care about them. I just want to know what's happening with the brothers. Cole is a bit of a blowhard with his, "I know everything" schtick, when it's patently obvious that he's completely outfaced by the guy he's after. 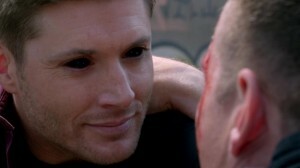 I loved the way Dean smirked as he told Cole he was a demon. Guess I love me some bad!Dean. The snarl of frustration is the only thing that makes me think my theory may be wrong. Really I think he's just super conflicted about being a demon and he doesn't want to be. I so agree, Jensen's portrayal of DemonDean is freaking amazing, and what Jared is bringing to Sam's relentless pursuit of his brother is killing me. They're both so good. And I don't caaaare about the angels when I could be watching them. It was good watching Cole put in his place because of what he'd done to Sam, and that DemonDean got such glee out of it made it even better. 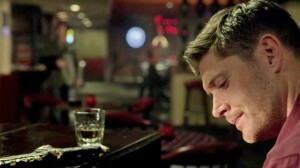 I'm with you on loving the bad!Dean. We've hardly ever gotten any, so I'm enjoying the hell out of it while it lasts. Ah! This is such a great reaction post. I felt pretty much the same as you did, and made myself a phone background to use of the con photo couple pic. Whoops, forgot the point of this comment, which was to say: HANDHOLDING GIF :D :D Thanks for posting that, I hadn't noticed. The handholding gif is perfect isn't it? I had to rewind the show a few times to catch it, but I was really looking to see if DemonDean was letting himself be caught, but then, hands, awwww. You made a phone background? 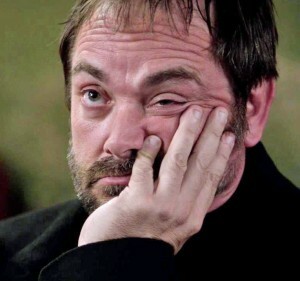 That is a perfect use of that picture, Crowley probably would love it. Wonder how long he's going to be pining for his bestie?